The Morkie (also known as a Yorktese or Malkie) is a cross breed, or 'designer' breed, which means that Morkie puppies have ancestry in two different purebred dog breeds. In the case of Morkie puppies, they are a cross between a Maltese and a Yorkshire Terrier (also known as Yorkies), hence the name, Morkie. Both Yorkies and Maltese are members of the toy breed group, so you can expect your Morkie to be a small dog, usually in the range of 4 to 8 pounds when fully grown. Cross breed puppies generally take characteristics from both of their ancestral breeds, but usually have an appearance closer to one of its ancestral breeds. However, within a single litter of puppies, there may be some puppies that look more like a Maltese, while other puppies will look more like a Yorkie. As you can see, the puppy in the picture to the right takes on more of the characteristics of a Yorkie. The term Morkie can technically be used to define any dog that has ancestry in only the Maltese or Yorkie breeds, although some breeders will have dogs listed as Morkie puppies for sale that do not meet this criteria. Even dogs that do meet this criteria can vary widely in appearance. In genetics, a hybrid that is the result from two distinctly different parent breeds is called a first filial generation hybrid, or an F1 hybrid. In terms of a Morkie, an F1 hybrid is a Morkie whose parents are a purebred Yorkie and a purebred Maltese dog. An F1 Morkie could then be bred with either another F1 Morkie, a Maltese or a Yorkie and the result would still technically be a Morkie, but a second generation Morkie. At Keegan's Puppies, we breed and offer for sale ONLY F1 hybrid Morkie puppies, meaning that our Morkie puppies are bred using purebred Yorkie and purebred Maltese dogs. To breed our Morkies, American Kennel Club (AKC) registered purebred Maltese and Yorkies are used to ensure the desired characteristics, traits and appearances of the Morkie puppies. The purpose of breeding a hybrid puppy like a Morkie is to have the positive characteristics of both the Yorkie and Maltese present in a single dog, such as being a hypoallergenic puppy. The further in their lineage a Morkie puppy is from the purebred Maltese and the purebred Yorkie, the less pronounced these traits are in the the Morkie puppy. For instance, a second generation Morkie dog may or may not be hypoallergenic, since they are not directly descended from a purebred Yorkie dog. Since the term Morkie is a fairly generic term, the appearance of Morkies can vary widely. However, in our experience, F1 hybrid (first generation) Morkie puppies fall into one of three categories . F1 hybrid Morkie puppies will either be black and tan Morkie puppies, butterscotch Morkie puppies, or tri-colored Morkie puppies, which are black and tan with white coloring around their nose and chest. Black and tan Morkie puppies look very similar to Yorkies in appearance, although the black isn't as dark and the tan isn't as vibrant as you would see in a purebred Yorkie. The picture above shows what a black and tan Morkie looks like. 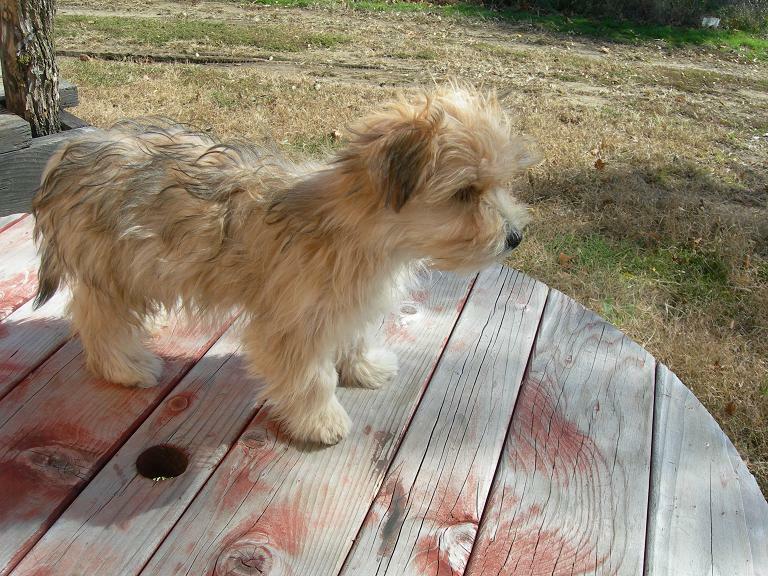 The second category of an F1 hybrid Morkie puppy's appearance is butterscotch, which can also be referred to as blonde. Butterscotch (blonde) Morkie puppies have few to no black markings on them. The picture to the left is a picture of a butterscotch (blonde) Morkie. 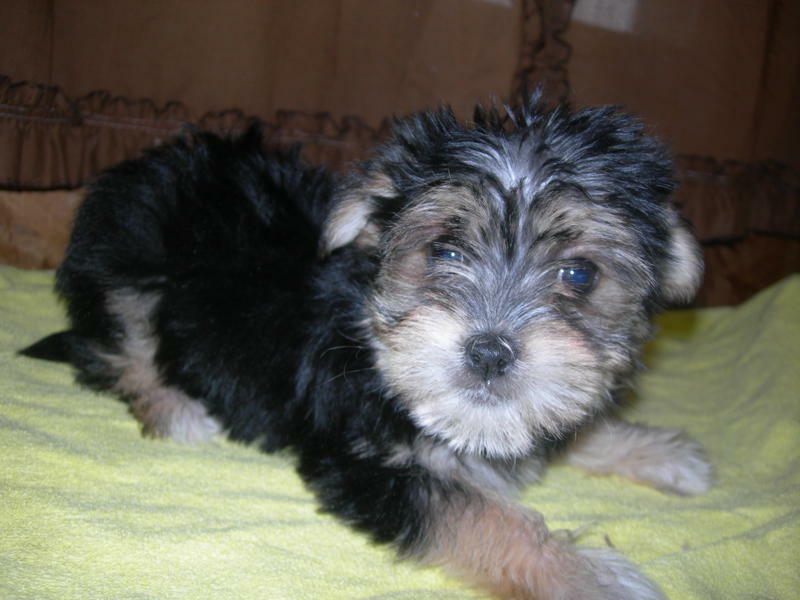 The third category of an F1 hybrid Morkie puppy's appearance is tri-colored, which is very similar to black and tan Morkie puppies, except tri-colored Morkies also have white coloring in addition to the black and tan. The picture below shows a tri-colored Morkie that has white coloring around it's nose. We will have black and tan, butterscotch or tri-colored Morkie puppies available for sale throughout the year. Please scroll down to see the Morkie puppies we currently have available for sale. As with all cross breed dogs, Morkie puppies will take traits from both of their ancestral breeds. Maltese are generally gentle-mannered and affectionate, known for being playful and fearless as well as fast learners. Yorkies, like all terriers, are brave, curious and energetic. You can expect your Morkie to have some, if not all of these traits. To learn more about the traits of Morkie puppies, you can investigate the traits of the Maltese and Yorkie breeds by using the links to the left. However, the best way to determine the temperament of any Morkie is to meet it and spend time with it, as every Morkie and every dog is unique. Temperatment is also affected by the parents of the Morkie puppy as well as the environment in which the Morkie is raised. All of these will provide clues to the temperament of your Morkie puppy before you bring it home. Morkie puppies are generally small and therefore are easier to travel with than larger dogs. As a smaller dog, they require limited exercise. However, they do require daily interaction with people as they like to socialize. Morkie puppies are very gentle mannered, but are full of energy and very playful, which makes them great family pets as they are great with children. Morkie puppies are easily adaptable to their surroundings and make suitable pets for most homes. Morkie puppies do require some grooming, as they can have a long coat if not trimmed. Below are the Morkie puppies that are currently available for sale or adoption. If the Morkie puppy you are looking for is not currently available for sale, you can join our puppy waiting list to be informed when new Morkie puppies are available for sale. You can also view the other puppies that are currently available for sale. If you have a general question about the Morkie puppies that are available for sale or adoption, or any questions about Morkie puppies, you can contact us and we will be happy to answer your question. Unfortunately we do not currently have any Morkie puppies for sale/adoption. To be informed when we do have Morkies puppies for sale, you can join the puppy waiting list here. 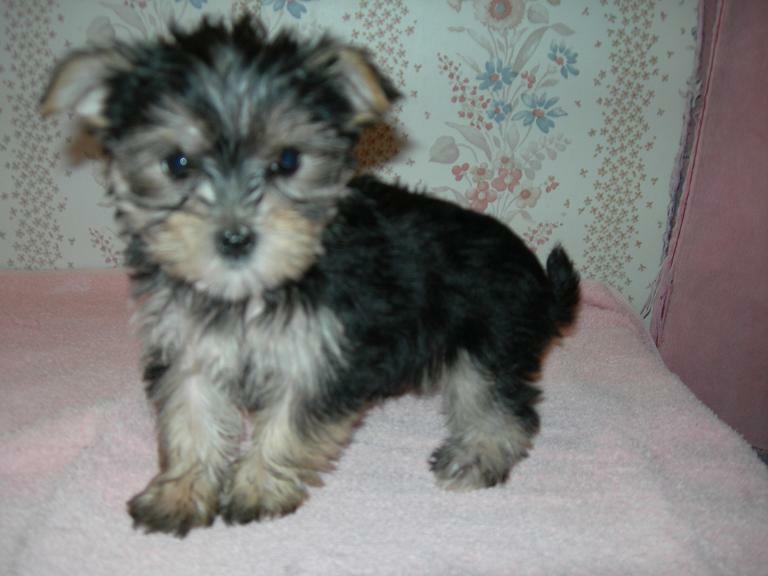 *Note: The video above is a Morkie (Yorktese) puppy that we previously sold. We are located approximately 2 hours from the downtown Kansas City Kansas, Kansas City Missouri, Omaha Nebraska and Council Bluffs Iowa metro areas. We also serve customers in Topeka, Manhattan, Lawrence, Overland Park, Olathe, Wichita, Shawnee, Hutchinson, Leavenworth, Leawood, Emporia, Prarie Village and Salina Kansas, St. Joseph, Independence, Lee's Summit, Blue Springs, Liberty, Gladstone and Raytown Missouri and Bellevue, Grand Island, Kearney, Fremont, Hastings, Columbus and Lincoln Nebraska. We have Morkie puppies for sale in Kansas, Morkie puppies for sale in Nebraska, Morkie puppies for sale in Iowa and Morkie puppies for sale in Missouri.